These days, it seems like zombies are everywhere: movies, television, comics, video games, you name it; if it is a form of entertainment, it has a big zombie franchise or two. Some of them take themselves very seriously (The Walking Dead), and some of them don’t (Dead Rising), but all of them exist, and most of them are trying to get into your wallet. Because of that, the genre has grown a bit monotonous in recent years. Sure, sometimes we get an interesting take on the zombie idea (see: The Last of Us or Telltale’s The Walking Dead), but by and large all of these games boil down to the same thing. You are a dude, and you are going to shoot a lot of zombies, and you’re going to like it, dammit. And rather appropriately, zombie games have become something of an undying scourge, infecting every publisher and developer, each game feasting off one another’s ideas until there were no new brains left to munch on, and no new ideas to consume. Or so we thought. I never would have imagined that EA, of all publishers, would be the one to prove me wrong, and I certainly wouldn’t have expected Plants vs. Zombies to be the game that brought something new to the genre’s fully occupied table. "There isn’t a more wacky or irreverent zombie game than Plants vs. Zombies. You might be able to make an argument for Dead Rising, but for all the series’ zaniness, it takes place in a semi-believable world." In terms of concept, there isn’t a more wacky or irreverent zombie game than Plants vs. Zombies. You might be able to make an argument for Dead Rising, but for all the series’ zaniness, it takes place in a semi-believable world. 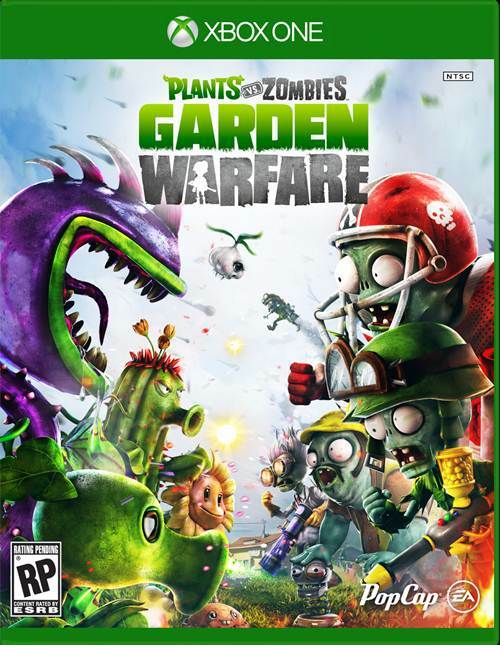 Well, at least when you compare it to a game where sentient plants, lead by a man in a flying RV, battle zombies in an epic attempt to save… humanity’s lawns. As lovingly bizarre and oddly humorous as this premise was, it worked well for what the first two games were: tower defense titles that, of course, required you to defend a set location from the encroaching zombie horde. But a tower defense game is one thing, and a shooter is another. How on earth do you translate that kind of style, and parts of that gameplay, into a third-person shooter without alienating your core audience or compromising your design? Hell, how do you do it at all, period? Apparently, the answer is “pretty easily” when you’re PopCap and EA, who have managed to do the impossible with Garden Warfare: they’ve retained Plants vs. Zombies signature humor, art style, and charm, and managed to build a good third-person shooter around it, to boot. "Like most competitive shooters these days, Plants vs. Zombies: Garden Warfare is a class-based title, but in the traditional sense. There’s no create a class here, and that is a large part of what makes Garden Warfare so much fun. " 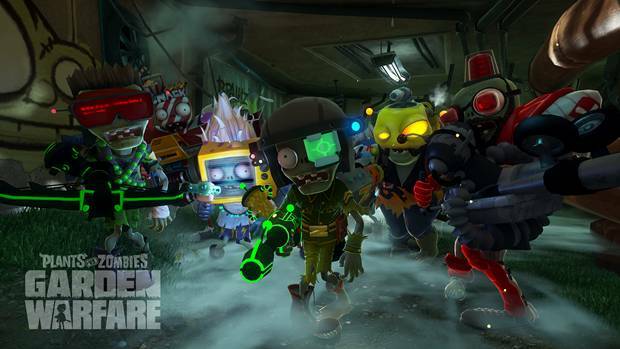 Like Titanfall, another game to come out of EA of late, Plants vs. Zombies is an (almost) entirely online experience. Sure, there’s a solo and co-op survival mode you can play with a buddy on your couch, but the core of the game’s appeal comes from the online matches. Competitive play has you side with either the plants or the zombies as they attempt to wipe each other from the face of the earth. 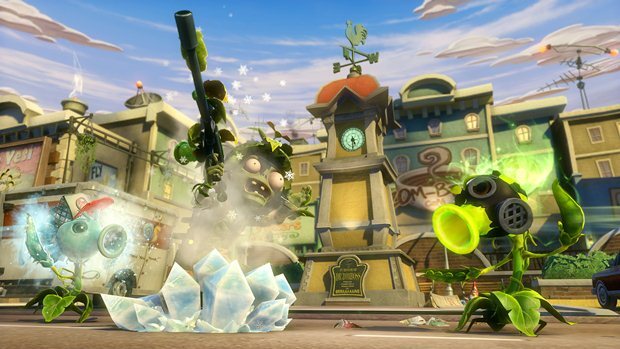 Like most competitive shooters these days, Plants vs. Zombies: Garden Warfare is a class-based title, but in the traditional sense. There’s no create a class here, and that is a large part of what makes Garden Warfare so much fun. Both sides are broken down into unique classes that fulfill certain roles on the battlefield, but the two sides are not identical counterparts. The plants, for instance, have access to the chomper, a powerful plant with the ability to burrow and instantly kill other characters should it attack from underground or sneak up on them from behind. Meanwhile, the zombies get the engineer, who wields a grenade launcher as well as grenades that stun all plants in range, and force burrowed chompers out of the ground. Even the more standard shooter classes, such as the peashooter and the foot soldier, differ dramatically from one another. The peashooter fires explosive globules and chile beans and has access to a gatling gun, as well as an ability that increase his movement speed a jump height for a brief time, while the foot soldier has access to a jet pack, a machine gun, a rocket launcher, and smoke grenades. 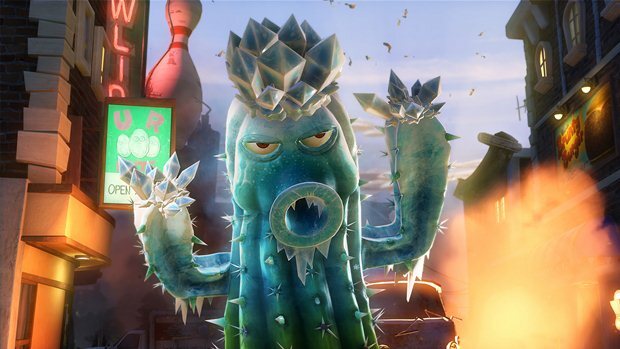 "Garden Warfare isn’t so much about killing your enemy as it is about helping your team. It’s about that last-second revive, that lucky shot, the big save, a smart flank, that last desperate stand against a superior force." As you can imagine, these subtle differences do quite a bit to affect the way each faction operates, especially when you have all eight of the classes (four on each side) in play, and Garden Warfare thrives on this well-balanced, asynchronous design in a way that few games do. Like the best multiplayer games on the market, Garden Warfare isn’t so much about killing your enemy as it is about helping your team. It’s about that last-second revive, that lucky shot, the big save, a smart flank, that last desperate stand against a superior force. It’s those moments where you can really feel a team working together and helping each other that the title comes together, and the game rewards you for each and every action that pushes you towards those ends, no matter which mode you play. Sometimes, however, the best way to help your team is to simply kill the enemy. Team Vanquish, for instance, pits you and your eleven allies against twelve enemies in a race to fifty kills, known in this game as vanquishes (after all, this is a family title), while encouraging you to revive your teammates whenever possible, as reviving a player subtracts a kill from the enemy’s score. Team Vanquish is fun, but Gardens and Graveyards is where the game really shines. The mode tasks the plants with defending a series of gardens from the zombies, who must do their best to capture the next point in a set time limit. It’s reminiscent of Battlefiend’s Rush, with the caveat that only one point is being contested at any given time, which makes engagements intimate and intense. If the zombies push the plants back to their last stronghold, they’re tasked with a bonus objective, such as destroying key switches or invading a base. It adds a lot to the mode, and gives you a reason to keep fighting, even if you’re on the losing team. "Team Vanquish is fun, but Gardens and Graveyards is where the game really shines." There’s also a mode called Gnome Bomb, which is reminiscent of Assault in the Halo series. Each team is tasked with capturing a garden gnome equipped with a bomb, delivering it to the enemy base, and guarding it long enough for it to explode. It’s a fun mode, especially as a quick diversion, but it doesn’t hold up when compared to Gardens and Graveyards or Team Vanquish, and you’ll likely spend most of your time in one or the other, depending on your individual preferences. Those looking for a more traditional Plants vs. Zombies experience will want to check out Garden Ops, the game’s cooperative mode, in which a team of four player-controlled plants attempts to hold out against ten increasingly difficult waves of zombies, as well as the occasional boss wave. Playing against the AI isn’t nearly as tactically engaging as playing against other people, but the game makes up for it by throwing a lot of enemies for you, and limiting the number of times you can be revived without assistance. The mode can get difficult pretty quickly, and teams really have to work together if they want to endure all ten waves and then survive long enough to escape. After each match, you’re awarded coins based on how well you did and what actions you took. You can spend these coins on packs of stickers in the Sticker Store, and rewards include cosmetic items for your characters, new character variants with new costumes and tweaked abilities, and single-use cards that will allow you to summon defensive plants or zombies at certain points on the map. There are hundreds of different stickers to unlock, which adds quite a bit of replay value, especially if you’re determined to collect all of the items and costumes. "Everything is colorful and well-animated, and the game runs flawlessly, no matter what happens onscreen." The collection and customization really underscore the importance of the game’s art design, which has been modified admirably for 3D gameplay. Everything is colorful and well-animated, and the game runs flawlessly, no matter what happens onscreen. Garden Warfare may not be a game that will wow you with its amazing technical graphics, but it’s a genuine joy to watch all of these colorful characters and environments interact with one another. The sound design is equally good. The music is frequently enjoyable, and the sound effects are distinct, and in the case of the things the characters “say” (it’s all gibberish), often quite funny, and you’ll find yourself using certain abilities, such as the peashooter’s hyper ability, just to hear the things that they say. "Plants vs. Zombies: Garden Warfare is a well-designed shooter that puts a fresh spin on the zombie game, and is the kind of title that can be enjoyed by just about anyone, even if they do end up wishing there were a little more meat on these bones." Unfortunately, however, that’s really all that Plants vs. Zombies: Garden Warfare has to offer in terms of content. 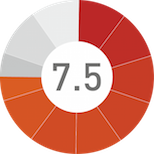 There are quite a few maps to play on, and each one provides a different experience, but the lack of overall content is a little hard to swallow, even at a $40 price point. Still, it is a very fun game, and one that works far better than it has any right to. It would have been easy for Garden Warfare to fail, like so many other series that have switched genres, but it doesn’t. PopCap clearly understands their IP, and they managed to successfully reinvent it in a way that feels fresh while being true to Plants vs. Zombies as a franchise. 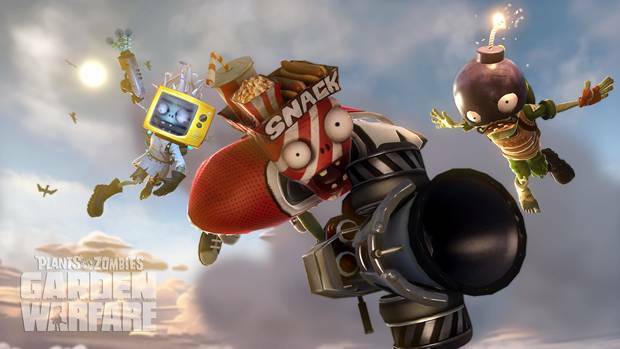 As it stands, Plants vs. Zombies: Garden Warfare is a well-designed shooter that puts a fresh spin on the zombie game, and is the kind of title that can be enjoyed by just about anyone, even if they do end up wishing there were a little more meat on these bones. Well-balanced asymmetrical gameplay. Good map design. Excellent visual style that translates into 3D well. Gardens and Graveyards is a blast. Not a lot of modes to play. It takes a long time to unlock new stickers. 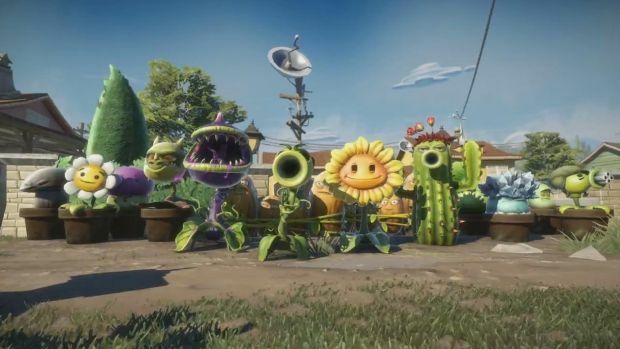 Despite its lack of modes, Plants vs. Zombies: Garden Warfare is a well-designed shooter that puts a fresh spin on the zombie game and will be fun for all ages.